Aspirants looking for AFCAT 2017 Syllabus, Exam Pattern PDF Download kindly check out the complete article below. "Fire in the belly leads to success" - as they say will help you to clear AFCAT exams. My friends AFCAT exams are the entrance written exams conducted twice a year for Air Force Officers entries for the post of Flying branch, Technical and Ground duty branch. Candidates applying for the exams for the first time need to know the exact paper pattern of the exam and also we have discussed various tips and tricks on how to clear AFCAT written exam paper in very first attempt. kindly go through the complete article and any queries or questions in mind feel free to ask below in comments. Generally AFCAT written exam cutoff marks is between 125 - 130 marks out of 300. so candidates have to score for near about 150 marks in exams to clear the written examinations and would also help you for merit list scorings. AFCAT Paper consists of various subjects where candidates can score according to there capability.Subjects are Verbal Ability in English, GA, Numerical Aptitude, Reasoning etc. First of all we'll talk about English. Generally the paper is easy if you are well versed with English. But if you are not, don’t worry, you can still clear it. There is a pattern that is followed in this exam. There are certain things which come for sure. These are Antonyms and Synonyms, Comprehensive Passages, Spotting the errors, Jumbled Sentences and Ordering of sentences. Now if you follow a planned approach towards the exam you can easily clear AFCAT. 1. Synonyms and Antonyms- People think there are n number of words in the vocabulary, how on earth is it possible to know them all. However, the smart way to catch hold of this portion is to Pick up the previous year’s AFCAT question papers and take a note of all the words that have been asked. Now write them on blank sheets one by one. Trust me when you do this, half of the work is done. Because mere reading them from the book won’t help you remember them. so when you do this, the words remain in your mind for a longer duration. Second step is memorizing. Have you ever tried early morning studying? Yes. I'm talking about getting up early in the morning and just reading those words which you have written. Give them a glance. Then try remembering them. Third step is to use these words in your routine. For e.g.- I try to use these synonyms or antonyms in my conversation as far as possible. Be it Facebook chat or whatsapp or your face to face conversation with your friends. Because when you do so, they stick in your mind. The reason behind this is, when we use these words in our daily communication, our brain tends to form an image related to the conversation in which you have used the words in particular. Like you are sitting on a bench in park with your friend and while talking you have used a word, then next time you hear that word, you'll immediately remember the word and hence will be able to answer it correctly. So this is how you crack this exercise. 2. Spotting the errors- We all know that finding faults in others is in the nature of humans. Haha... So why not put it to better use and clear AFCAT exam? This exercise consists of sentences divided into four parts and one of them has an error or no error in the whole sentence at all. This exercise is completely based on grammar. So the basics should be clear.There are various rules regarding grammar. Usually we talk slang English and tend to go by them in the exams too. This is the line where most of the people go wrong, even though there spoken English is good. The rules based on Noun, pronoun, tense, phrases, adjectives etc all are given in that book. Plus it has sample exercises too. Now what you have to do is, first, carefully read the rules written in the book and try to memorize them. And then start solving them one by one. Initially you will be able to solve only a few but over a period of time you will solve most of them. This is based on practice, so please practice. 3. Jumbled sentences- These are quite tricky. One needs to read the sentence first. The trick here is do not try to solve the question all by yourself, don’t try to find the sequence all by yourself. AFCAT has given you options, just apply the options and one of them will be correct. Most of the candidates try to bring out the sequence and then the look for the matching option. This consumes time and hence they find it difficult to score in here. During the exam- the moment you get the question paper, go through it, just give it a glance, and have a good feeling about it. My personal experience says that if you have a positive feeling that you can successfully solve the paper then your chance to clear AFCAT has a high percentage. Moving on to the part of General Knowledge, this is the section where candidates call it as unpredictable questions. But the beauty about this paper is , candidates belonging to all the streams have an equal opportunity to solve this paper. Like students of science, commerce and arts can solve them easily if they have the right approach. In this paper, a pattern has been followed over these years. The portion of science holds 30% marks, Current affairs- 20%, geography- 20%, polity- 20%, history- 10%. This is the usual pattern. The candidates are worried about current affairs the most. 2.History- Thoroughly read the AFCAT book you can buy the book from the link given below. The reading should be normal. Don’t stress yourself with the first reading itself, like what are the dates, who what when….. The best way to know about history is…. “His-story”. Read it as if it were a story. Actually it is a story if you see it from one angle. After you are done reading the whole syllabus thrice, now go ahead and start off with making datelines. As you know there are three parts in history, i.e. Ancient, Medieval and Modern. Make notes, like give headings, subheadings and some details. When you are done with the first 2 parts, and come to modern history, you will have to have a different approach. Here start with making notes about all the governor generals and viceroys. Their tenure, what all happened during their reign, who all were the eminent personalities then, etc. And then come the revolutionary movements. One by one just make notes about all these movements led by our freedom fighters. This way, you can cover up the portion of history. 6.Science- Physics, Chemistry and Biology. Regular science stream students have the advantage here, but other students too can score well here. The concepts involved in this subject are basic so read from the book and get your basics clear. Then start solving previous years question papers. There is not much to mug up her, its science… so start off with solving sample questions. This will help you beforehand to score well and clear AFCAT exam. The question papers in the last few years have been tough! Not that the difficulty level is raised but the questions are lengthy, hence consume time. Most of the candidates consider this subject as a scoring one, and indeed it is, but where they fail is, they don’t practice enough. This is not a subject where you can go with the attitude of last minute reading or glance. Here you need to put in long hours and solve maximum no of questions in stipulated time. Time and work, Time and Distance, Percentage, Profit and Loss, Ages Problems carry more weight age. Focus on these topics more. Also solve previous years question papers, that too in time limit. This will make you land scoring good marks in math’s and hence you will clear AFCAT exam. So everyone out there who really wants to clear AFCAT, work hard my friends, because there is no short cut to success. If you work hard, you’ll end up seeing yourself in that uniform, for sure! Candidates are requested to start preparing for AFCAT written exams with the above given sure shot tips to clear the afcat exam. Daily study and practice will surely help you to achieve success in the examinations. Also appearing candidates can download the previous year question papers for guidance and start solving questions which will help you for time management from the link provided below. keep following Jobsfundaz for AFCAT 2018 Syllabus, Exam Pattern PDF Download and notes which will help you for exams we will be updating our page for you. Generally AFCAT results is announced in 45 days after exams so keep visiting our page for latest updates and notifications we will update on our page once its officially announced. Any Queries or questions in mind regarding AFCAT exams or SSB feel free to ask below in comments. 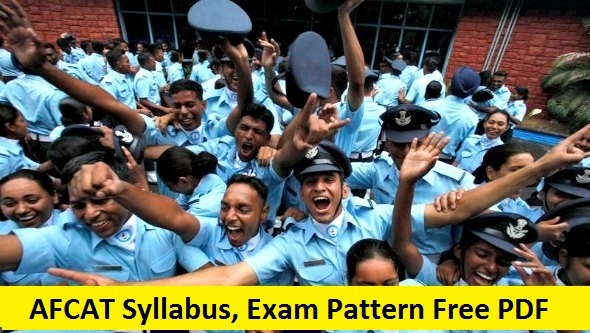 Candidates want to share there ideas or tipfor any questions regarding AFCAT 2018 Syllabus, Exam Pattern PDF Download kindly share with our readers.